Dream Doors, the UK’s No. 1 kitchen makeover company, is set to have its best year ever, with a projected annual turnover of £50m and a new product range going on sale. 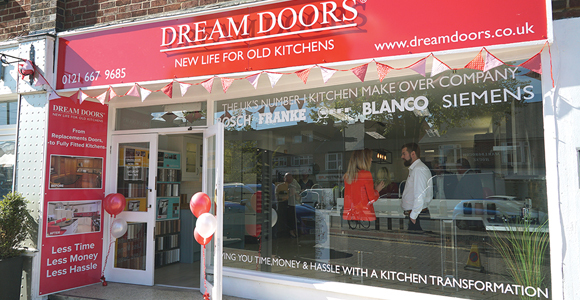 Last year, Dream Doors’ franchisees generated over £44million in sales – making it a record year for the company and a strong foundation for future growth. Part of that growth will come from Dream Doors’ brand new range of bedroom furniture, which is being promoted on a dedicated new website and provides increased earning potential. For most people, that potential to make great money is the main draw of franchising. So, what can Dream Doors offer you? Among the highest earners in the Dream Doors network in 2018 were Angela and Clive Coldwell of Poole, who generated over £1.3m in sales. Clive said the Dream Doors model has proved to be ‘far more lucrative’ than either he or his wife ever imagined. He added: “When you buy into a Dream Doors franchise, you buy into the knowledge and expertise that comes with it. “Most franchises are about being a one-man band with a van – that’s not what we wanted. We wanted to grow more than that. Clive and Angela’s business certainly has grown, with them making over £8million worth of sales since their showroom launched just a few years ago. Perhaps you’re drawn to the idea of franchising as a way to restore some work/life balance and to spend more time with your family while still earning great money. You don’t need any sales or business management experience to make a Dream Doors showroom a success – all you need is £35,000, with the opportunity to borrow the remaining start-up requirements through bank funding, and the ability to follow a tried and tested business model. New starters go through a comprehensive three-week training course after which they begin making sales and earning good money immediately. Dream Doors’ dedicated business development managers help new franchisees set up their showroom and hold a grand opening which always generates great publicity. Business development managers support Dream Doors’ franchisees throughout their trading lifecycles as do the company’s award-winning marketing and sales support departments. So, with the potential to earn £150,000 a year, for modest start-up costs AND regaining control of your work/life balance as part of a market-leading brand – why wouldn’t you want to be part of Dream Doors’ success story? We also have some highly lucrative showroom resale opportunities available following the early retirement of some very successful franchisees. Interested parties from anywhere in the UK are encouraged to contact director of franchise recruitment, Alex Waite, on 0808 273 6729, visit www.dreamdoorsfranchise.co.uk or email alex@dreamdoors.co.uk.